At nearly 103 years old, Doug has evaded death at least three times. The secret to his good luck? Being in the right place at the wrong time. Born in Halifax in 1916, Doug’s first near-death experience happened before his second birthday. On December 6, 1917, two ships collided in the Halifax harbour; the ensuing explosion caused a tsunami, snapped trees, injured an estimated 9,000 people and killed almost 2,000 more. The Halifax Explosion is an event still remembered on the east coast today. The windows were blown in, cutting his mother’s back. Doug had some scratches, which his aunt, who was living with them at the time, patched up. Doug recalled that when she’d finished you could only see his two eyes beneath all the bandages. Afterwards, Doug and his family moved out of Halifax. He did not return until he was stationed there during WWII. Doug first signed-up for the navy just after WWII broke out, and only a short while after having his appendix removed. He was refused entry because of his recent operation, and so tried again in June 1940, and was accepted. His first posting was in Ottawa. He met Thyra, his future wife, at a local eatery they both often frequented. After running into one another several times, Doug and Thyra began dating. They stayed together after Doug was reposted to the east cost and Halifax. He worked on convoy duty in Northern Ireland for the rest of the war, ferrying ships. He was a lieutenant on the ship, and one of his jobs was to plot the information picked up by the ship’s detection systems. It turns out one of the crew members had dropped charges off the stern and into extremely shallow waters. The resulting explosion had rocked the ship, but thankfully not damaged it. In 1942, Doug received leave to join Thyra and her parents for Christmas in Renfrew, Ontario, outside of Ottawa. They took a train back to Ottawa on December 27th. They checked the two cars at the end, but both of them were filled and had people standing in the aisles. When they got back to the third-from-last car the seat was still vacant and the woman reserving it said they could have it. A steel train filled with military troops had come around the corner, unaware of the train already in Almonte station. It hurtled into the back of Doug and Thyra’s train, obliterating the last two cars and splitting the third in half. Thirty-six people died in the Almonte train wreck and more than 150 were injured. The crash was blamed on poor weather and other circumstances that made the crash almost inevitable, such as preventative lights at Almonte station not being put out correctly and a communication error at another station. Despite this, the conductor of the troop train drowned himself days after the crash. After the accident, Doug returned to the war. Almost a year later, in 1943, he asked for leave again. This time to marry his girlfriend of two years, Thyra. He was supposed to have 2 weeks off, but it was cancelled at the last moment, giving him 48 hours to get married. After his weekend wedding, Doug returned to his posting on a ship in Northern Ireland. When the war ended two years later, he described it as an extremely happy time. He was discharged in October 1945 and returned to Thyra and their daughter. He then went to the University of Toronto for physiology, which complemented the chemistry degree he had earned before the war. He studied the pituitary gland for many years. At the time, Best, from Banting & Best Diabetes Centre, was head of the department, and a lot of the work they did was centred on diabetes. 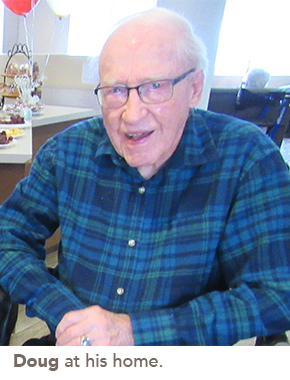 Today, Doug enjoys reading and living life at Island View Retirement Residence in Arnprior, where he lives. When asked about his secret to living a long life, he said he didn’t have one. “If I had a secret I could make billions of dollars,” Doug said with a laugh. Find inspiration in the life of Olga Dimitrov, a two-time Genie winner for costume design in film, who designed for stars such as Donald Sutherland.